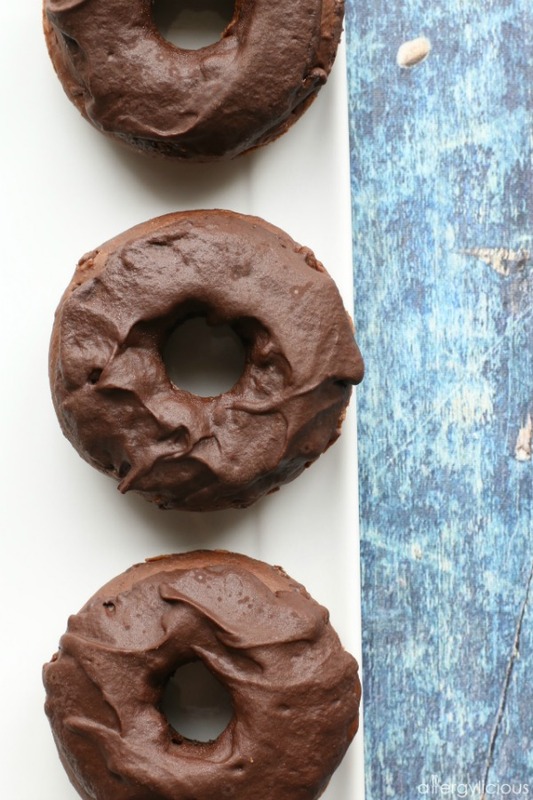 Fluffy, perfectly baked chocolate cake donuts made in less than 30 minutes! Gluten free, nut free, and topped with a vegan melted chocolate. 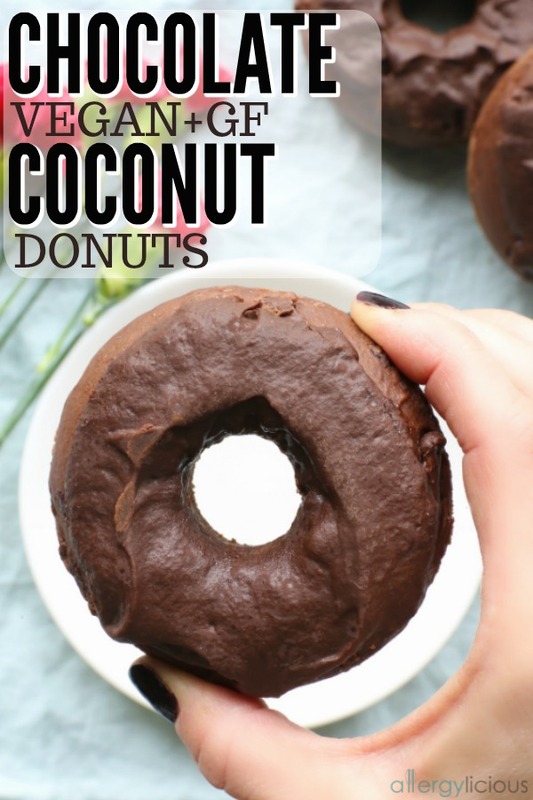 I LOVE homemade donuts and these Chocolate Donuts will not disappoint! These baked donuts are good. So good. I’m talking magical. Swoon worthy, do a happy dance kind of good. A girl’s gotta have her chocolate and if you can find a way to have it for breakfast, then that’s a win! But don’t stress too much about eating so much chocolate first thing in the morning. These cakey donuts are baked (not fried), vegan, nut-free & gluten-free so they’re a little healthier than most. Omit the melted chocolate on top if you wanna cut back even more, but really, if you’re gonna eat a donut, then just splurge a little and enjoy it as is. Typically I like to make donuts over the weekend so the kids have something special to wake up to. I also love making these for special occasions like Valentine’s, Mother’s Day, and Birthday’s. But I don’t really need a special reason to make donuts…..I just need to pick which recipe I want to use. On the blog, you’ll find a few other options out there in case chocolate isn’t your thing (how is that even possible?). Carrot Cake Donuts are one my favorites and would be amazing for an Easter brunch, Baked Pumpkin Donuts are perfect for Thanksgiving or any fall get-together, Cinnamon Sugar Sour Cream Donuts are a classic flavor and go well any time of year and there’s even Maple Glazed Donut Muffins in case you want to change it up a bit. See….donuts for everyone! But I just can’t ever refuse a homemade chocolate donut. Moist & fudgy, spongy and cakey, this easy recipe for baked chocolate doughnuts with melted chocolate coating is a chocolate lover’s dream! 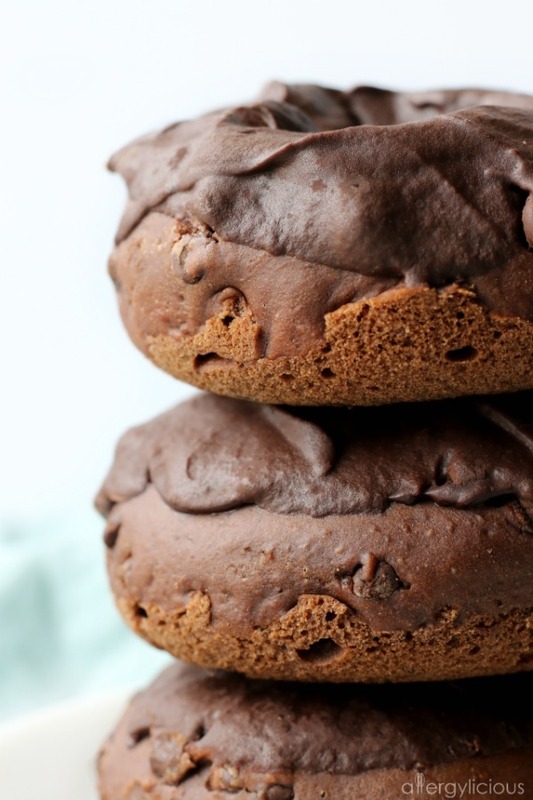 These double chocolate donuts are so much better than any of the the ones from the bakery! What type of donuts are your favorite? Did you like adding yours with sprinkles on top? 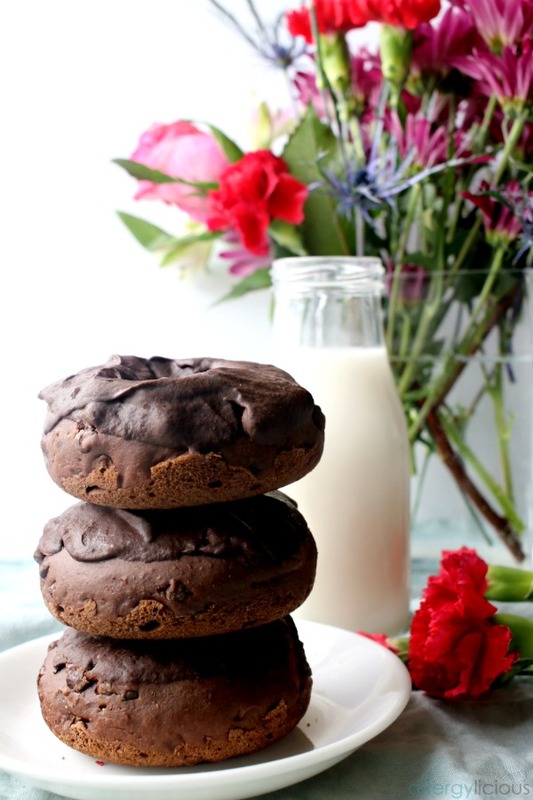 Fluffy, perfectly baked chocolate cake donuts made in less than 30 minutes! Gluten free, nut free, and topped with a simple vegan melted chocolate icing. In a large bowl, sift together dry ingredients: flour, cocoa powder, baking powder, baking soda and salt. In a medium bowl, whisk together: coconut oil, yogurt, brown sugar, coconut milk, and flax milk. Stir this into your flour mix, just until incorporated. Fold in the shredded coconut then fill each donut cavity a little more than half full. Bake 12-15 or until the tops bounce slightly when touching it. Let cool 5 minutes in the pan and then finish cooling on a wire rack. Using the double boiler method, fill a small saucepan half-way with water over a medium boil. Fill heatproof bowl with chocolate and place overtop. Stir to help the chocolate melt and then carefully remove from stovetop. Dip the tops of each donut into melted chocolate and place back on the cooling rack until chocolate sets. *Depending on the GF flour you use, be sure to check if Xanthan gum is needed and if so, add in as directed on packaging. **Can also substitute All Purpose Flour, cup for cup , in this recipe. ***I blended the choice to milk, only so the coconut flavor was not overpowering. However, feel free to use only 1 type if you don’t want to use multiple. Chocolate doughnuts are life! My very favorite kind, and these look exceptional, my friend! Thanks Linda! We would make a great team…I’ll make the sweets and you make the spicy/saucy. As far as I’m concerned, chocolate is the only kind of donuts worth eating! These look fab! Thanks Dianne! We sure enjoy spoiling ourselves every once in a while with these donuts. These donuts are delicious. Chocolate is my favorite kind of donut. I put coconut shreds on top too, my favoriteeee type. Ohhhh, coconut shreds on top would be a perfect addition to these. I’m so glad I’m not alone with thinking melted chocolate is a MUST . Those look scrumptious Nicole. You are becoming such a GF/V baking whiz! Do you find it difficult to flip flop recipes between wheat flour and GF flour? I sometimes find that my gluten-free recipes don’t convert well to wheat flour. Yes Alisa, I do find it difficult at times, especially depending on the flour I’m using. In fact, I was trying a new GF flour over the weekend and threw out every batch of cupcakes, cake and muffins I made. So frustrating at times. The flour really does matter. SO far, Bob’s is the only one that I found yielded the most accurate results (but its not a dedicated NF facility). Oh my goodness…I wish I had one of these little beauties right now! THey look amazing. 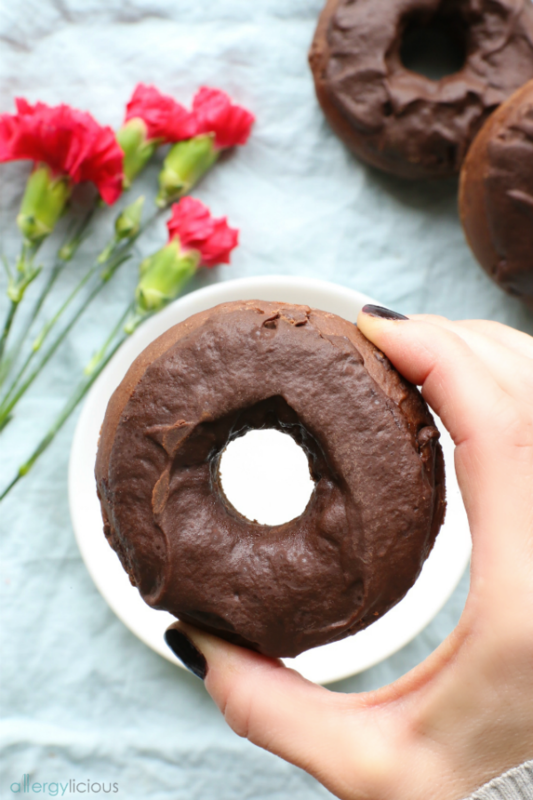 I love indulging in chocolate donuts once in a while…especially when they are vegan. Yum! Hey Kate, I agree…vegan chocolate donuts are a must once in a while. You really did it girl, yes you combined chocolate covered + chocolate donuts in the same recipe 😀 biting into one of these must taste like heaven. And I can’t believe the list of ingredient is so simple, I might just have all it takes to make them 😀 now I know what I’ll be doing this afternoon !! Oh yes Francesca!!!! 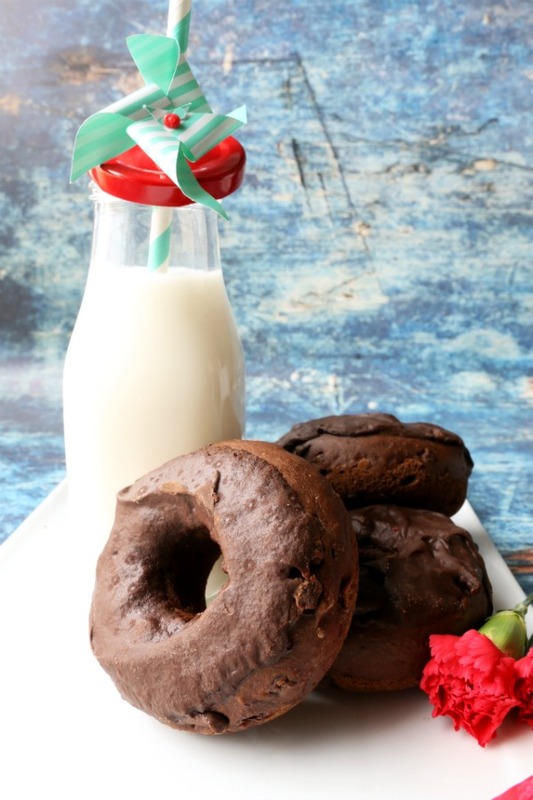 Simple ingredients make chocolate donuts so much more attainable :). These look so good! I’ve never wanted a donut as badly as I want one now. Is the coconut milk canned (the “real” coconut milk)? Or is it a thinner milk, like so delicious or silk?